I love the snowmen - I think they are so cute! The pattern, "Under the Stars", is from the Rabbit Factory . 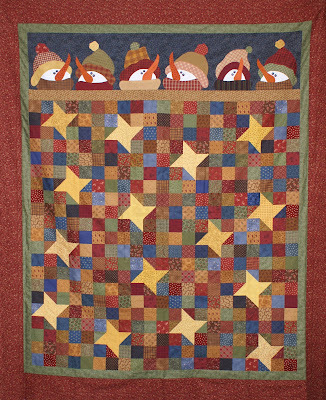 I modified the design to include six snowmen across the top and added more star blocks making the overall size of my quilt a bit larger (approx 68"x80") than the original. It's not my own design - I made it based on a photo in quilt magazine from a few years ago, but I can't find the magazine now - probably got tossed out in last year's house move. 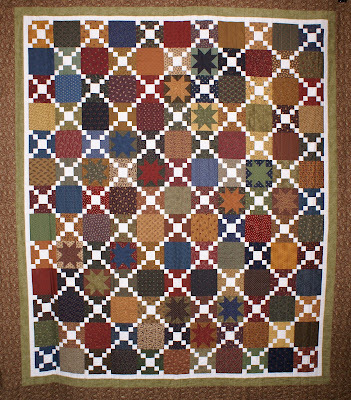 This quilt is a big one at 84" x 96". Thanks Mom! I love the way it turned out - it looks great! I can't wait to get mine for my new apartment! Looks great mom!